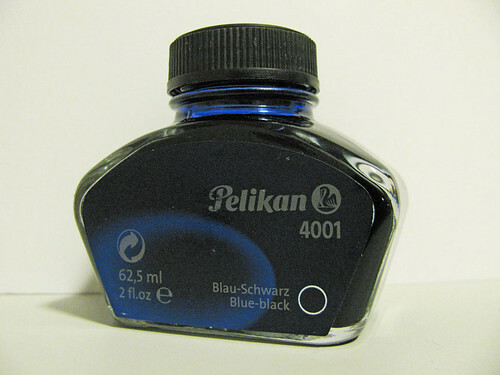 Pelikan Blue Black is a member of Pelikan’s 4001 ink line – their standard, bottled fountain pen inks. It is a pleasant blue-grey that reminds me of denim, and is moderately saturated while exhibiting a modicum of shading. The color of the ink is not dramatically affected by the color of paper – it lays down a consistent line on both bright-white Rhodia paper and off-white Moleskine paper. 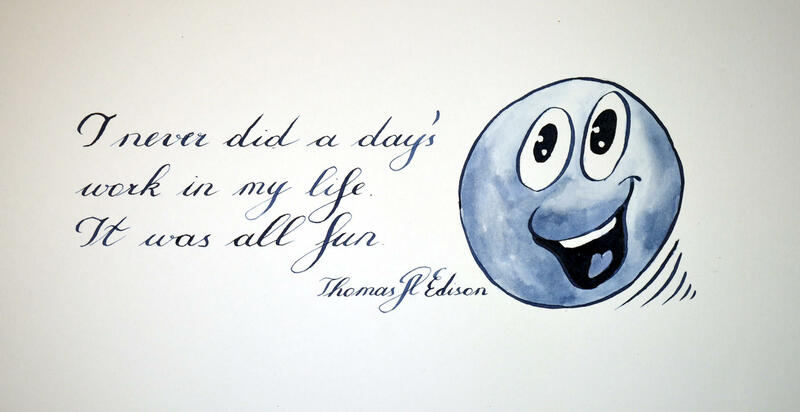 Blue Black is a dry writing ink, which makes it a great choice for taming wet-writing pens. It’s about as dry as Lamy Blue, but provides much better lubrication. In my Pilot Falcon with a medium nib, this ink produces a line more like a fine nib. As a result, this ink demonstrates a very low level of feathering, show-though, and bleed through – even on the thin paper of a Moleskine cahier. Surprisingly, though, the drying time was longer than I expected – it took twelve seconds on Moleskine journal paper before it was smudge-proof. When I ordered this ink, I was under the impression that it was of the waterproof variety. Alas, I was mistaken. According to Pelikan, this is not a waterproof ink. It’s permanent, in the sense that it is resistant to fading, but it is not waterproof. My testing reveals that it does possess a moderate degree of water resistance. Running it under water gradually reduced the strength of the line over the course of several minutes, and rubbing the ink while wet increased the rate of dispersion. Thus, I think it’s appropriate for addressing envelopes – a little rain won’t render it illegible – but wouldn’t be my choice for signing checks. Pelikan inks come in both 30ml and 62.5ml bottles. While they’re not especially fancy, they’re aesthetically pleasing enough that they could sit atop one’s desk instead of in the drawer. The 62.5ml bottle that I purchased has nice, wide mouth, which is good, but also has a flat bottom, which I suspect will make soaking up the very last drops of ink more difficult than it needs to be. Pelikan Blue Black is my first experience with Pelikan inks, and from what I’ve seen, it won’t be my last. It’s definitely geared to business use, as blue-black is a traditionally conservative ink choice, but it’s perfectly usable for personal journaling. While it’s not especially exciting, it is a good partner for my wet-writing pens, it’s inexpensive in quantity, and it behaves quite well on all of the papers I’ve tested it with. I predict that it will stay in my rotation – it’s a good, solid, workhorse of an ink. 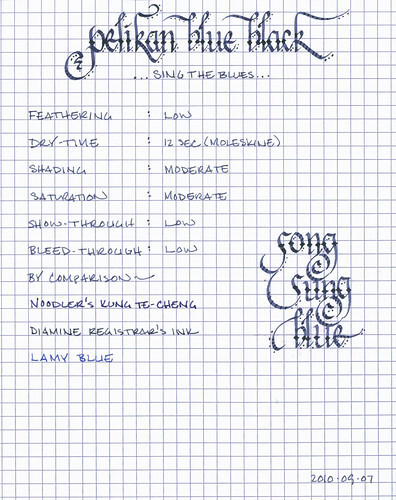 Review notes: for the wide strokes, I used a Lamy 1.9 mm steel calligraphy nib on a Lamy Joy. For the narrow strokes, I used an EF steel nib on a Lamy Safari. The paper is bright white 80gsm from a Rhodia No. 16 Bloc Pad. Great review David. The ink sounds like it's a solid performer. Never been a fan of blue-black inks though. Thank you for this fantastic review. How do you think it would work in a flex nib? I think the OP is long gone (years). In my experience it works really good in flex pens. It is a bit on the dry side as many IG inks, if your flex pen is a real gusher (quite often e.g. on old Waterman) this ink can help to tame such pens. It behalves really well, is a nice shader and imho the surface tention is quite right that flex pens does not tend to railroad. In general I really like to use IG inks in flex pens as in my experience they harmonize often really good with them. 4001 Blue-Black only has a low potion of IG and is imo one of the big evergreen classic inks which proofed itˋs qualities for many decades. Probably my favourite ink of all time. Thank you! I didn't realize how old this review was. I will try a bottle as it's a really good price and another one to use with my vintage flex. I always thought dry inks wouldn't work well with flex nibs.